Multiple artifact collections unearthed in the U.K. suggest that the earliest known museums could date to around 680 B.C. or even earlier. They force a rethinking of what museums are, and how certain ancient populations valued treasured objects. Museums, by their definition, are institutions or organized groups that conserve a collection of artifacts. Such a collection, now called the "Tisbury Hoard," was found in a field in Wiltshire, England. At first they thought the find was just "a compact mass of corroded bronze," Boughton said. Further digging instead revealed multiple treasures. "It contains around 114 bronze weapons, tools and ornaments, and was probably buried in the early Iron Age, in or towards the end of the seventh century B.C.," Dot Boughton, a researcher with the Portable Antiquities Scheme, wrote in a paper published in the latest issue of British Archaeology. While the objects were buried simultaneously, they cover a span of 1,000 years. At first this might appear to be some metalworker's sample kit, or an individual's private collection. But since multiple hoards of this nature featuring different types of objects have been found in key locations in the U.K., Boughton believes that the collections were "community museums." One of the first objects to be found from the Tisbury Hoard was this spearhead. In total, 40 pieces of weaponry were included in this particular collection. Often craftsmen recycled old metal objects, but this and many others appear intentionally to have been saved and grouped with additional artifacts. 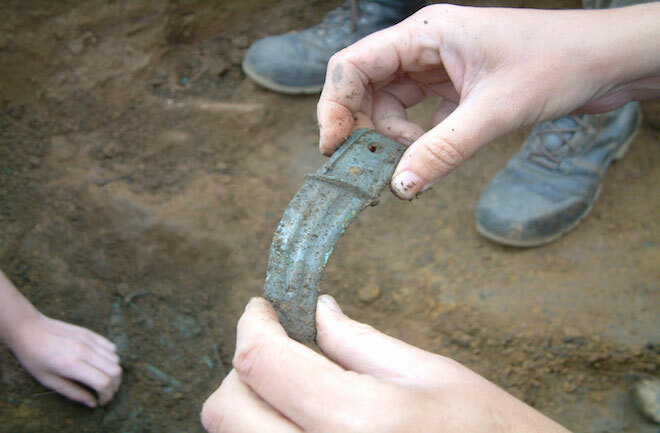 This bent knife blade was also recovered at the Wiltshire dig. Archaeologist Mike Pitts, who edits British Archaeology, told Discovery News, "Hoards of prehistoric bronzes are common in northern Europe, and have become even more so in Britain with the success of the British Museum's Portable Antiquities Scheme, which brings metal detectorists and archaeologists together. Usually the stuff in the hoards is more or less contemporary, often interpreted as a smith's work in progress, scrap and raw materials; or the stock of a trader." But the latest discoveries have experts such as himself and Boughton thinking "there has to be another explanation" for at least certain artifact groupings. The community museums, he shares, perhaps could have been "in the form of shrines" offering "respect for distant ancestors." 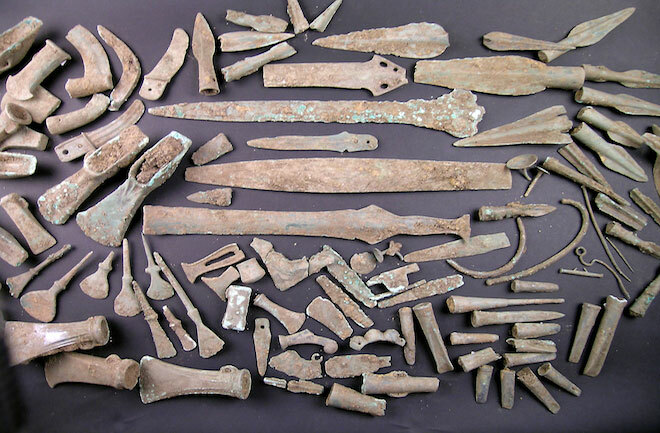 The 114 pieces of the Tisbury Hoard include axes, tools such as chisels, swords, spearheads, pins and ornaments.They again date to different time periods, yet were buried together over 2,600 years ago, according to the new research.